WASHINGTON – Roger J. Stone Jr., a longtime informal adviser to President Donald Trump who has spent decades plying the dark arts of scandal-mongering and dirty tricks to help influence American political campaigns, was arrested early Friday after an indictment was unsealed in the special counsel investigation. Stone was charged with seven counts, including obstruction of an official proceeding, making false statements and witness tampering, according to the special counsel’s office. The move is the first indictment in months by the special counsel, Robert Mueller, who is investigating Russia’s interference in the 2016 election and possible coordination with Trump associates. Stone and his lawyer could not immediately be reached for comment. Stone, a self-described dirty trickster who began his career as a campaign aide for Richard Nixon and has a tattoo of Nixon on his back, has long maintained that he had no connection to Russia’s attempts to disrupt the 2016 presidential election. He sometimes seemed to taunt U.S. law enforcement agencies, daring them to find hard evidence to link him to the Russian meddling campaign. His brash behavior made him less of a subject of news media scrutiny than other current and former aides to Trump – like the character in a whodunit who readers immediately dismiss as too obvious to have committed the crime. But the special counsel’s investigators spent months encircling Stone, renewing scrutiny about his role during the 2016 presidential race. Investigators interviewed former Trump campaign advisers and several of his associates about both about Stone’s fundraising during the campaign and his contacts with WikiLeaks, one of the organizations that made thousands of Democratic emails public in the months before the election. Before dawn on Friday, FBI agents arrested Stone at his home in Fort Lauderdale, Fla.
Three senior Trump campaign officials have told Mueller’s team that Stone created the impression that he was a conduit for inside information from WikiLeaks, according to people familiar with their witness interviews. One of them told investigators that Stone not only seemed to predict WikiLeaks’ actions, but also that he took credit afterward for the timing of its disclosures that damaged Hillary Clinton’s candidacy. In social media posts and numerous interviews before the 2016 election, Stone indicated that he had advance knowledge that a trove of information damaging to Clinton’s campaign might be about to spill into public, and even suggested that he had personally spoken to the WikiLeaks founder, Julian Assange. Stone has changed his story in the months since, saying that he was not actually speaking to Assange and that he had no direct knowledge that Russians were responsible for the Democratic hackings. Still, it was revealed last year that, in the weeks before the election, Stone was messaging on Twitter with Guccifer 2.0, a pseudonym used by one or more operatives in the Russian intelligence scheme to steal the emails and funnel them to WikiLeaks. Stone himself has said publicly that he was prepared for the possibility that he could be indicted, but he has long maintained that he is innocent and has often echoed Trump’s claims that Mueller’s investigation is a politically motivated witch hunt. “It is not inconceivable now that Mr. Mueller and his team may seek to conjure up some extraneous crime pertaining to my business, or maybe not even pertaining to the 2016 election,” he said. The tumultuous relationship between Stone and Trump goes back decades, with Stone acting as an informal adviser to Trump as he considered running for president several times. When Trump formally announced during the spring of 2015 that he was running for president, Stone was one of the first members of the team, but within months, he had a public dispute with Trump and left the campaign. The two men have remained close, though, speaking often by telephone. 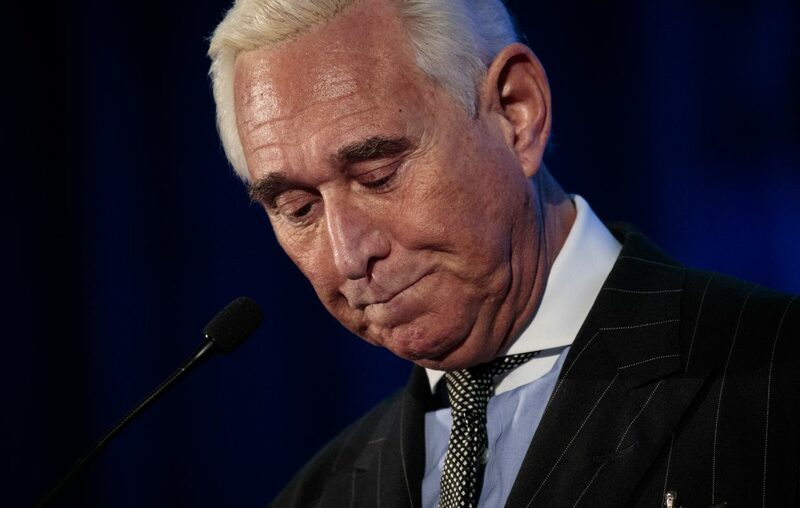 Stone revels in his public persona as a bete noire of American politics, and has taken credit for helping unearth scandals about Democratic politicians. In 2008, he played a role in revealing an affair between a prostitute and Eliot Spitzer, who was then the governor of New York. Spitzer immediately resigned from office.